Easter is the most important feast day of the Christian church. It is a moveable feast and the methods of calculation used to determine the date are very complex. Easter must always occur on a Sunday, as Sunday was the day of Christ’s resurrection. The date is calculated taking into account lunar and solar calendars. In the early church there were several methodologies used at different points in time to determine the date. By the 5th and 6th centuries there was divergence within the church as to how to calculate Easter. In Ireland, northern and western Britain (an area which had strong links to the Irish church, as Irish missionaries had converted this area), the church used an eighty-four-year Easter cycle and assigned Easter to the Sunday that fell between the fourteenth and twentieth days of the lunar month. This system of calculation was at odds with the Continental church and the church in southern Britain (that had strong links with Rome). These churches used a system devised by Victorius of Aquitaine (457 AD) and from 630’s the Alexandrian system to calculate Easter. With two systems for calculation in play divergent dates for Easter often occurred. This meant Easter could be celebrated at different times of the year in different geographical locations. In the mid 7th century Rome began moves to bring uniformity to the Christian church. This uniformity extended to a standard date for Easter across the Christian World. In 630 Pope Honorius wrote to the Irish threatening excommunication if they did not conform to the Roman way of calculating Easter. 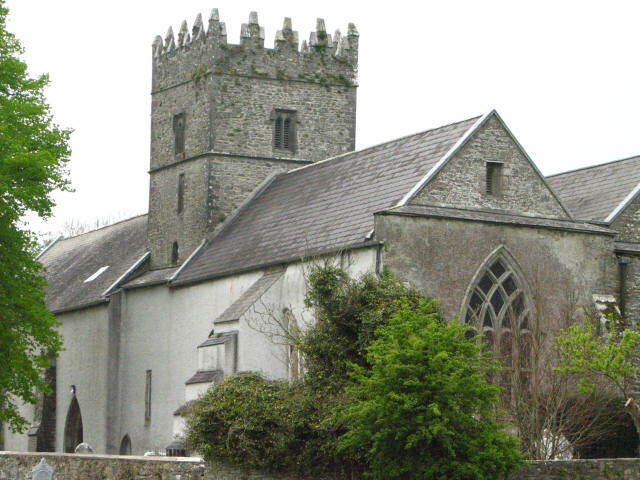 As a result of the this letter the southern church in Ireland held a synod in 632 at Magh Lene or as it is known today Old Leighlin in Co Carlow. The synod probably took place at the site of Old Leighlin Cathedral which is built upon the ruins of an early monastic site founded by St Gobban in the early seventh century. At the time of the synod St Laserian who was the successor of Gobban was the leader of the religious community here. The synod decided to send a delegation to Rome. Tradition holds that St Laserian was among the delegation. Upon their return the southern church decided to conform to the Roman Easter, however the northern church didn’t conform until it was accepted by the archbishop of Armagh in third quarter of the 7th century . In Britain the famous synod of Whitby 664 settled the question in favor of Roman system but some clergy unhappy with the outcome came to Ireland. For example St Colmán the bishop of Lindisfarne along with a group of monks from Lindisfarne came to Ireland and set up a monastery on Inishbofin Co Galway and later at Mayo. It was not until 716 that the Columban federation of churches finally accepted Roman Easter and there was uniformity throughout the Christian world concerning Easter. Grimmer, M. 2008. ‘Columban Christian influence in Northumbria, before and after Whitby’ Journal of the Australian early medieval association, vol. 4, 99-123. http://home.vicnet.net.au/~medieval/jaema4/grimmer.html. Kenny, C. Molaise. Abbot of Leighlin and Hermit of Holy Island. Killalla: Morrigan. Schaff, P. History of the Christian Church, Volume IV: Mediaeval Christianity. A.D. 590-1073. Ó Cróinín, D. 1997. Early Medieval Ireland 400-1200. London: Longman. This entry was posted in Uncategorized and tagged Easter question, Old Leighlin, St Laserian. I don’t think it’s very complex to work out when Easter will fall, nowadays anyway. Easter Sunday is always the first Sunday after the first full moon after the Spring equinox – that’s what I’ve heard anyway. Is this the Alexandrian method mentioned in the article? Hi Anna Porter, I am glad you have a better head for calculations then I. The Alexandrian method was used by Rome and the Continental church which is referred to in the post and until the mid 7th century the Irish and areas of Britain influenced by the Irish church fixed Easter to the Sunday falling in the seven-day period from the 14th to the 20th of its lunar month, according to an 84-year cycle. 😀 Nah, I’m afraid I’m awful at calculations (t.g. for calculators!) but the spring equinox is always the 21st March, then you just need to know when the first full moon after that occurs (available on calendars or internet); then Easter is the first Sunday after that full moon. The point is that the Spring Equinox is not always the 21st this year it was the 20th, the 21st is an average date of occurrence, the earths orbit is not a perfect circle. But then the rest follows as above. Easter is the first Sunday after the first full moon on or after the vernal equinox – Council of Nicaea in AD 325. Except – the vernal equinox is neither the 20th nor the 21st (nor, indeed the 22nd!) of March – it’s the day the western Christian church says is the vernal equinox, and the full moon date is the date the western Christian church says is the full moon date. And they do this using what are called tables of epacts and the ‘Golden Number’ of the year in question. The relationship with astronomy is a bit tangential. “there was uniformity throughout the Christian world concerning Easter [in 716]” — I believe you are ignoring the Welsh (and maybe other Britons) who did not change to new Roman system until 768. Thanks very much for your short explanation of a quite complex matter… complex the way we’re oblivious today of sky and stars, I mean 😉 and as we forget as well than Early Church was not so uniform as it’s shown in films and novels. And thanks too to the commenters, and the calculators!